of life, challenging it to disown it. – R.S. Thomas, Counterpoint (Newcastle upon Tyne: Bloodaxe Books, 1990), 20.
graveclothes of love’s risen body. I suspect the line “of other thought of answering” should read “or other thought of answering” but I might be misreading it. An astonishing image: ‘the spoor/in the world’s dark/ leading away/from the discovered victim’. Perhaps the most crucial phrase in the poem comes in the opening line? ‘they say’? Perhaps this is a disavowal of a god of popular belief? A hauntingly beautiful poem, in any case. It has a Cormac McCarthy feel to me. You’re right about the ‘they say’! If by ‘a god of popular belief’ you mean Satan I agree. As Girard would say, it is Satan who leads us away from the discovered victim, ensuring blindness with respect to our victimage mechanisms. Lol and those are some of his more hopeful ones…check out the two we recently looked at in a small group study. I really like how he engages with the apophatic stuff. Wonderful stuff Raz. 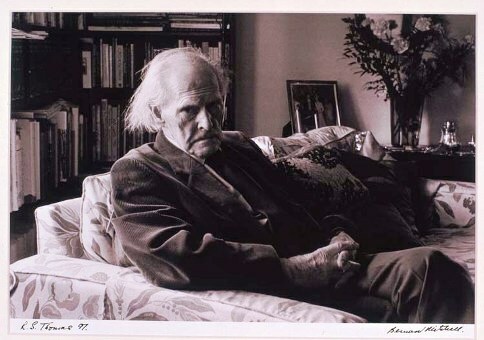 It’s most encouraging to see you reading RS Thomas. I’m slowly making way through his corpus, and I plan to post more of his poems.